Technology can, and already does, aid agriculture in innumerable ways. One prominent part of agriculture that can use technological innovation to increase efficiency and effectiveness is irrigation. Mark Trapolino | KROHNE, Inc.
As the world’s population continues to increase at a fast pace, more food and water will be needed to sustain humanity. In the past 50 years, we have tripled our need for water and food, and there are no signs of this trend slowing down. As a result of these conditions, smart, innovative agricultural practices are needed now more than ever. Technology can, and already does, aid agriculture in innumerable ways. One prominent part of agriculture that can use technological innovation to increase efficiency and effectiveness is irrigation. Irrigation is the method in which a controlled amount of water is supplied to plants at regular intervals for agriculture. It is used to assist in the growing of agricultural crops, maintenance of landscapes, and revegetation of disturbed soils in dry areas and during periods of inadequate rainfall. Additionally, irrigation also has a few other uses in crop production, which include protecting plants against frost, suppressing weed growth in grain fields and preventing soil consolidation. Irrigation systems are also used for dust suppression, disposal of sewage, and in mining. Irrigation is often studied together with drainage, which is the natural or artificial removal of surface and sub-surface water from a given area. Irrigation has been a central feature of agriculture for over 5,000 years and is the product of many cultures. Historically, it was the basis for economies and societies across the globe, from Asia to the Southwestern United States. Agricultural irrigation accounts for roughly 80% of the ground and surface water used in the United States, and could account for up to 90% of water used in western states. Some 53.5 billion gallons of groundwater are used daily for agricultural irrigation from 475,796 wells. 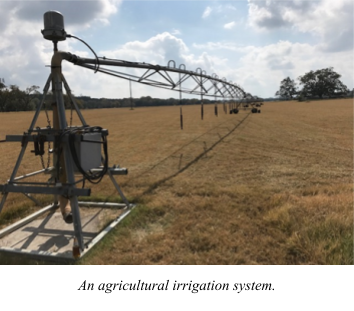 Irrigated agriculture is an indispensable part of the nation’s economy as it contributes significantly to the value of U.S. agricultural crop production, as well as supporting livestock and poultry production through irrigated animal forage and feed crops. (United States Geological Survey, 2015) However, all of this freshwater use in irrigation is wasteful. Worldwide, agriculture accounts for 70% of all water consumption, compared to 20% for industry and 10% for domestic use (http://www.worldometers.info/water/, 2018). Roughly 15-35% of irrigation withdrawals are estimated to be unsustainable, and the agriculture industry wastes 60% or 396 trillion gallons, of the 660 trillion gallons of water it uses each year. The key to a sustainable agriculture looking to the future is in water use, and it is clear that the current standards in place are much too wasteful to rely on. Water metering and measuring technology is at the heart of this issue, but there is not only one method or technology used to measure water flow in irrigation systems. In irrigation systems, water used to irrigate land is carried under pressure to its destination via pipes. Flow occurs in a pipeline when a pressure difference exists between the two ends of the pipe. 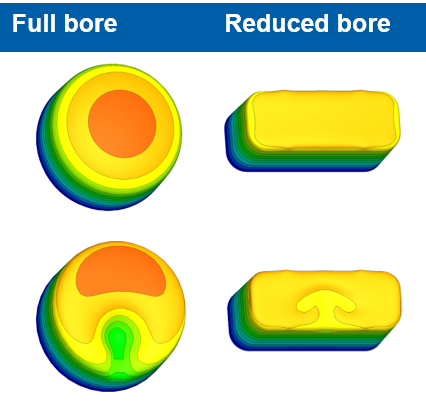 The rate or discharge that occurs depends mainly on the difference in pressure that exists from the inlet of the pipe to the outlet, the friction or resistance to flow caused by the pipe’s length, pipe roughness, bends, restrictions, changes in pipe shape and size, and the cross-sectional area of the pipe. Most flow measurement devices measure flow, or discharge, indirectly. These devices are commonly classified into 2 types – those that measure velocity and those that measure pressure. Regardless of the type of device, the pressure or velocity is measured, and then charts, tables, or equations are used to obtain the discharge, or flow. Some water measuring devices that use measurement of pressure to determine discharge include weirs, flumes, orifices, and Venturi meters. Other devices that work differently from those that measure water pressure include acoustic water meters, magnetic water meters, pitot tubes, and rotameters. All of these non-pressure-based devices work differently to determine water discharge. 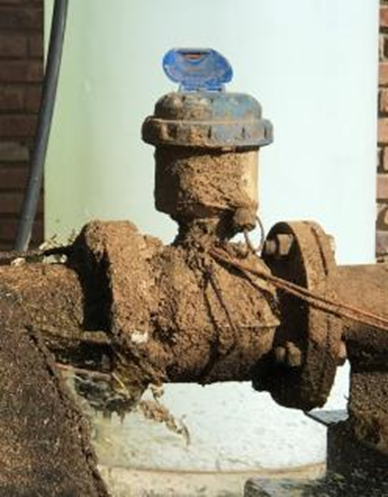 Ideally, a water meter is accurate, reliable, efficient, and compatible with the rest of the irrigation system it is part of. Accuracy is an obvious characteristic. Water needs to be accurately metered to avoid waste. Water meters need to be reliable for a similar reason – if the meter is breaking down frequently, there is no accurate way to measure water usage, which will result in waste. Water meters need to be efficient in terms of their installation and operation. Special requirements for installation only result in wasted time during the installation process, which, in a general sense, results in more wasted. Lastly, a good water meter is compatible with its irrigation or crop control system. Todays integrated irrigation and crop control systems vary in communication requirements. Using a meter that is compatible with data logging and telemetry software is hugely important in terms of the meter’s accuracy, operation, and maintenance. Of all the types of water meters listed above, magnetic meters are innovating more than others, and are more completely meeting the requirements for an ideal water meter. One magnetic meter in particular that is perfect for irrigation applications in agriculture is KROHNE’s WATERFLUX 3070 magnetic meter. The WATERFLUX 3070 is a battery powered all-in-one (integrated flow, pressure, and temperature measurements) electromagnetic water meter. Unlike mechanical water meters, the WATERFLUX 3070 is maintenance-free and offers a much larger turn down ratio (1000:1). Its measuring tube with a rectangular and reduced cross-section enables a stable measurement even at low flow rates. Due to the optimized flow profile, the WATERFLUX 3070 can be installed virtually anywhere without straight inlet or outlet runs – behind pipe bends, slide valves or a reduction in the pipe. Even burial installation or use in flooded areas is possible. The WATERFLUX 3070 has several key advantages for agricultural applications due to its rectangular reduced bore design. This unique reduced bore design acts as its own internal flow straightener, and also results in the meter creating a smaller magnetic field which has less power consumption, extending battery power life to up to 15 years with a KROHNE dual battery pack. The rectangular bore of the WATERFLUX 3070 is also effective in that it contracts flow profile disturbances, has an ideal coil arrangement for a strong and homogenous magnetic field, results in a doubled mean flow velocity, and enables a measurement that is stable and independent of the flow profile. Accurate: it features bi-directional flow measurement over a wide dynamic range and its unique rectangular sensor design gives good low-flow performance. Reliable: the WATERFLUX 3070 features a robust construction, with its sensor tube coated in Rilsan ® to guarantee a long life and its connection box is made from stainless steel. IN addition, the WATERFLUX 3070 features no internal moving parts, making it virtually maintenance-free. Efficient: Installing the WATERFLUX 3070 is quick and easy. It has no inlet or outlet installation requirements, features plug-and-play connectors, and can be installed virtually anywhere. To solve the water-use problems currently affecting the agricultural industry, better water metering technology is a necessity. Among the many types of water metering devices, innovative magnetic metering devices like KROHNE’s WATERFLUX 3070 check all the boxes for ideal water metering technology, and are showing the way towards more efficient and effective water use in agricultural irrigation applications.